This blog has been, first and foremost, about studying tailored clothing, often analyzing other people’s methods so that readers and I can learn something. Up until now the focus has been solely on the construction of tailored garments; for the first time, I wanted to study somebody else’s method of selling tailored garments. The ready-made tailored clothing industry is almost 150 years old; many of the companies still producing in the United States themselves are well over the century mark, and most of us are very prone to the “but we’ve always done it this way” disease. And it really is a disease. I happen to think that London’s west-end tailors fell to this a long time ago- they felt so confident in the fact that they were the world leaders in quality tailored clothing, as they were for a very long time, that they never noticed that many other schools of tailoring worked so hard at improving themselves and in many cases they ended up surpassing the product being sold on Savile Row. 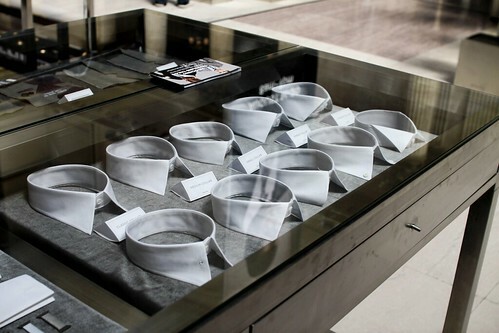 The men’s made-to-measure industry in the US may be nearing that moment right now. My last post mentioned Indochino, one of the numerous upstart MTM clothing companies. 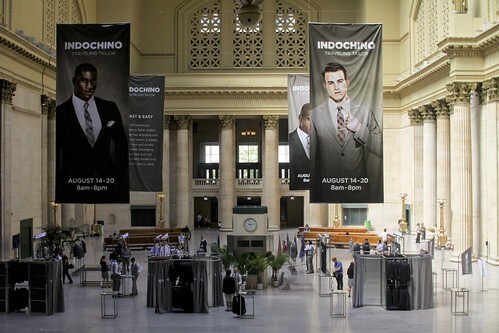 When Indochino first hit my radar a few years ago, I wasn’t overly impressed. Aside from my deeply-held skepticism about internet-based MTM, and self-measuring in particular, there were some glaring quality issues at the time. When I encountered them at our convention in Spain this spring, however, my ears started to perk up. They were addressing many of my initial concerns in some very fresh ways, ways that the rest of us, if we were smart, should learn from. When I heard they would be hosting on of their new pop-up stores at Chicago’s Union Station this week, I was very curious to go see for myself. Clothing geeks will be familiar with the name of Frederick Scholte, the famous London tailor who, in the beginning of the twentieth century, turned the industry on its ear when he developed a new silhouette called the Drape Cut, or the London Blade. It was pretty radical at the time, and by the 1930s became hugely popular with English and Hollywood royalty. There are many stories of manufacturing executives approaching Scholte, posing as customers, wanting to have one of his famous suits made so that they could study them and copy them in their new ready-made factories. Scholte was sharp, and he was also a curmudgeon; he could sniff them out pretty quickly, and they would be promptly tossed out of his shop. The twenty-something co-founders of Indochino are far more accommodating- when I told them that I wanted to take a look at their operation to see what I could learn from them, instead of tossing me out, they offered to make me a suit. Classy. 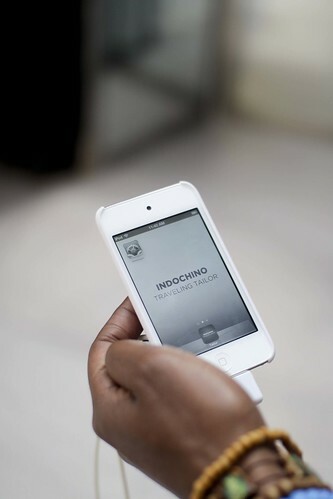 What sets Indochino apart is their approach to the shopping experience. Men generally hate to shop, and they especially hate to shop for clothes. There is one shopping experience, however, which manages to lure the male customer, and hang on to him, and these guys seem to know that; from the moment I walked in to their “shop”, I felt like I was at the Apple store. The shop occupied the great hall of Union Station, a gorgeous space to do an event like this. A space this big and this grand could easily dwarf a clothing trunk show, but the strength of the visuals, the fixtures, and the branding on every possible surface managed to hold its own, and occupied the space rather than being overwhelmed by it. Everything, from the coffee cups to the water bottles and cookies are branded with the sort of attention to detail that reminds one of Steve Jobs. You are met, upon arrival, by a host who will whip out their iPod touch to plug in a few basic details about you, such as name and email address. Al l in the Indochino App, of course. The generation of customer that they are targeting knows all about iPods and iPads and apps, so he feels immediately comfortable with the type of interface. This is not my father’s clothing store, it says. You are then handed off to a fit specialist who will measure you, and input those measurements into your file which they have brought up in their own iPod. In fact, at each step of the way, each specialist will have access to the information that the previous specialist has entered. Armed with your basic measurements, the fitter will select a size of garment for you to try on to determine your preferences in fit. Instead of the industry-standard sizing, they have come up with their own. These are two very important points. First, what one customer may think is far too tight, the next might think is far too loose. 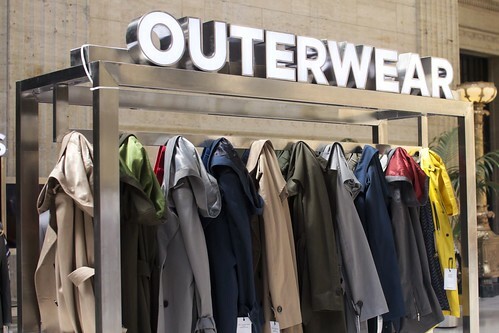 This is one of the challenges of any kind of e-commerce model where clothing is concerned; Indochino has chosen to address this with their pop-up stores so you can try stuff on, then when you want to order repeats, the process can be entirely internet-driven. Second, I know first-hand about people’s reaction to sizing- “what do you mean I’m a 44? I’ve never been a 44! I’ve been a 40 all my life!” “ Well, sir, have a look at the tape- it says 44- would you like me to pull it hard enough to get a reading of 40?” “That’s impossible. Your tape is wrong.” Well, customer in question has never been a size 8 and has no basis of reference, and no reason to protest. Very clever. 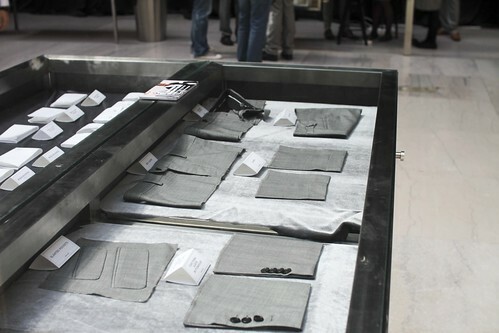 Alterations are punched into the iPad and you’re handed off to a stylist who will guide your choices. This is usually the part where the customer’s eyes glaze over and you lose him. He’s now off on some other planet and has no idea about, and even less inclination to make the sort of decisions about the styling of his suit. Show him a box of swatches and he starts to fidget; expect him to be able to visualize what a 4x6 rectangle of cloth will look like made up in a suit and you’ve just about pushed him over the edge. 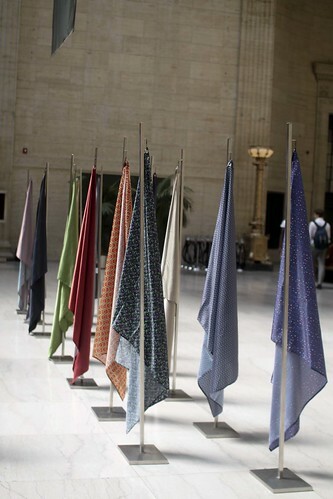 Indochino’s fixtures have full lengths of cloth which you can feel, play with, and even remove from the fixture to drape over your shoulder to get an idea of what the cloth will look like on you, with your own coloring and complexion. It makes every bit of sense. 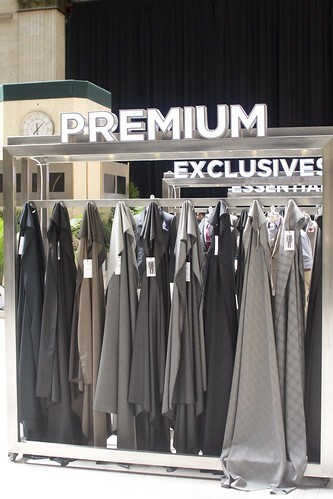 The ranges are organized on separate fixtures, and for those who are still challenged, photos of the cloth made up as a suit are attached. It’s about as dummy-proof as you can get. Linings are also rigged like the fabric choices. 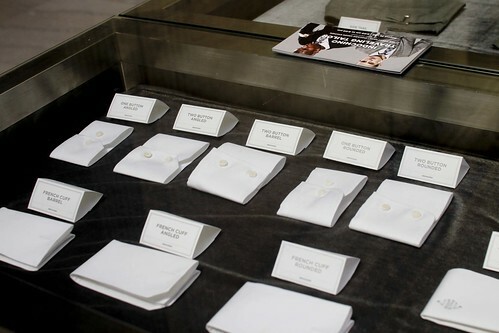 Details about cuffs, collars, hems, waistband finishings, are all displayed in well-labeled cases. And if you’re still not sure, just about every possible variation has been rigged so you can see it on a finished garment. Of course, there may be options available that they don’t have on hand. So there is a bank of (Apple, of course) computers where you can browse their website and see the entire range of options. When your choices have all been made, they are read back to you to confirm, and you’re off to the cash. Except there is nothing so pedestrian as a regular check-out counter; your credit card is swiped through the little square reader sticking out the bottom of an iPod and an email is immediately dispatched to your address with a receipt, a confirmation, and a delivery date. When your garment is delivered to your home three weeks later, Indochino provides a $75 credit toward any alterations which may be required and which can be performed by a local tailor. They also have a rep come back to town a month after their traveling tailor show to do follow-ups for alterations. Of course, if you are unhappy, they will also remake the garment for you. The results of the shopping experience itself are the result of approaching the business from an entirely new perspective. The downside to that, as they are discovering, is that the learning curve in tailored clothing is steep. Very steep. That said, the quality is vastly improved since the last time I looked closely at their garments, and if their efforts toward developing the quality of the garment match what they have done with the quality of experience, I have every reason to believe they will succeed. 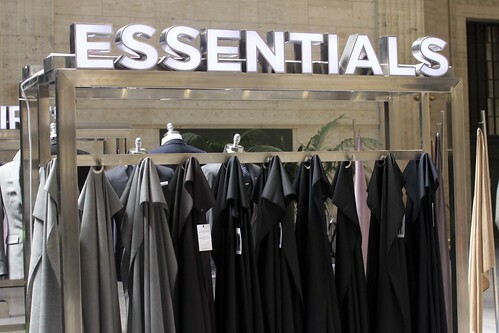 What they need now, in my opinion, is a partner or a buyer with clothing industry experience to give them the technical support and industry experience that they are currently lacking. If I were the CEO of a major manufacturing outfit, I would be very interested in what these guys are doing. Meanwhile, check back in three weeks to see how my suit turned out. Wow, really informative and well-written review! It's definitely piqued my interest in Indochino. Thanks! I will be most interested to see if they add options for women. I haven't had a decent women's suit since the Capper and Capper days. Great to have you back on your own site. Glad you're on SF too. Missed your writing over the past few months. It will be very interesting to see the guts of their suits. I'm sure their traveling program makes a huge difference in the fitting process compared to many I've seen on SF where the suit had to be totally remade b/c the on-line entered measurements didn't match the final garment. Great review and I agree with you that the outlook for the company is a bright one. I really admire the people behind this company for jumping on this idea of e-tailoring and their great service. No one can really argue that they have succeeded in marketing their product in an excellent way, albeit not always with positive results. I think that getting someone who knows the industry and can give them a little more knowledge on making a higher quality product would be a great idea. But I don't think its one of their goals to take a step in that direction, since doing so will go against what they stand for, and whats really behind their name; which is affordable tailored clothing. At the end if the day you're getting what you pay for, and getting a hand made product with much attention to detail is not something i think they're aiming for. But who knows, they might surprise a lot of people one day. I knew you looked familiar! I was the one asking if you were a blogger this afternoon...nice to make a cameo on your site. I was rather impressed by the setup at Union Station, but not necessarily by the temporary workers they had hired. I am interested to see how the results of the pop-up tailor compare in terms of quality and measurements vs. previous Indochino orders. Hopefully the computer-aided cutting will alleviate some of the prior QC issues I've experienced. 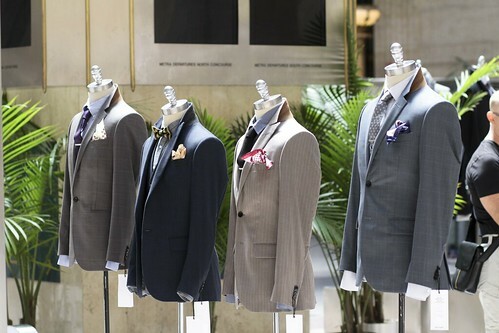 Are you planning to deconstruct the suit you purchased today? great review, honestly I think they are doing a good job in marketing and customer service, but probably there are better options regarding garment quality. I would say that other online tailors such as www.atailoredsuit.com or www.delavegatailors.com can provide better quality tailored clothes. 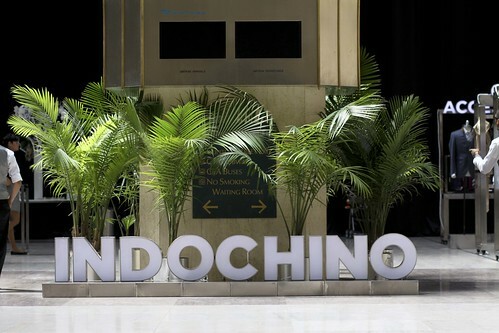 The success of Indochino, however, is impressive, and I'm looking forward to reading your comments in your next post about them! There have been a number of questions here and on my blog about a review or a dissection of the Indochino garment. While the nuance may be lost on most people not in the industry, my dissections have never been about commercial reviews of product, but rather about studying what other guys are doing and learning from it. Everyone in the industry does this,I just chose to put it out there for other people to see. For those who don't know, I work in the RTW and MTM tailored clothing industry, for a company that is probably familiar to most people on this forum. For that reason I have carefully selected garments for dissection which would not fall into the same market segment as those that we sell, to avoid any appearance of conflict of interest. I have also refused several requests to do product reviews from people who were offering product, for the sole reason that a proper "review" should be completely unbiased and impartial in fact and in appearance. 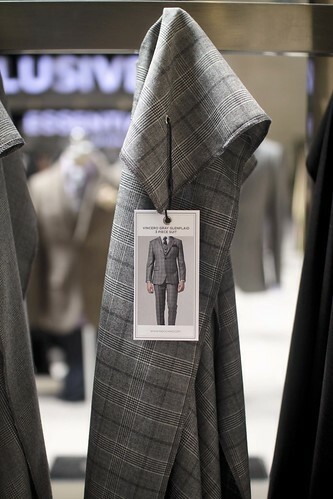 A fair and impartial commercial review should include the opinions of several reviewers, not just one, and they should be seen to be at arm's length from the product being reviewed; I think we can all agree that review of a Brioni garment done by an employee of Kiton would be somewhat suspect. 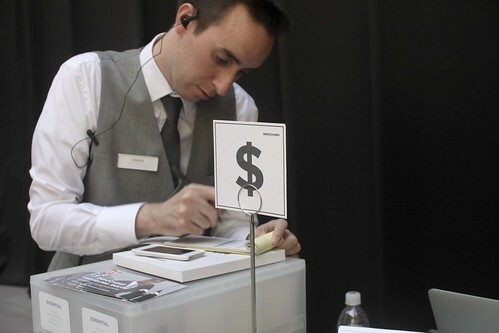 My visit to Indochino's popup stand, and my report on that visit, are intended more than anything as a wakeup call to my employers and to my competitors. Everyone is trying to tap into the younger market, but we tend to approach it the same way we sold to his father. What I saw this weekend was that there are far better ways of approaching it. The above was cross-posted from Style Forum. You most absolutely have built this website into something speciel. You clearly know what you are working on. With the pictures I feel like I am in your store! Did you give them a particular input regarding style and fit or did you let them do "their thing"? I would run if someone in pointy yellow shoes tried to take my measurements. How exciting! I love their approach and using the iTouch/iPads is a brilliant way to manage their customers while providing an efficient, effective shopping experience. I would love to visit one of their pop-up stores to see the process and feel the fabrics. Thanks for sharing! I can't wait to find out what you think of your suit - I hope it meets your expectations. @SG- It would have been tempting to "guide" them but then I wouldn't be getting the unadulterated Indochino experience. Instead, I just let them do "their thing". @Anonymous- I have seen many very talented tailors wearing much worse things than pointy yellow shoes. Your leap to judgement might shut you out of some great clothing. After a long wait the post has come. I mostly use your home page to access ASW and Timothy Everest. A great post and please continue posting. I'm eagerly waiting to see how the suit turns out. As an attorney I wear a suit almost everyday and I'm quite familiar with the solid American made brands in the price-point of $750-$1200 (Brooks Brothers, Joseph Abboud, Hickey Freeman) - the IndoChino three piece, with a shirt included, cost me $750 with tax. They threw in a cheap tie, cuff-links, tie-bar, and nice pocket square. I don't expect Zegna quality. I also wonder if the young staff measuring me have the experience to perform the task assigned. I'm also concerned that the wool for the pants, jacket and vest may not be cut from the same wool roll - I understand that is very important. But we shal see. All in all it was a positive experience. 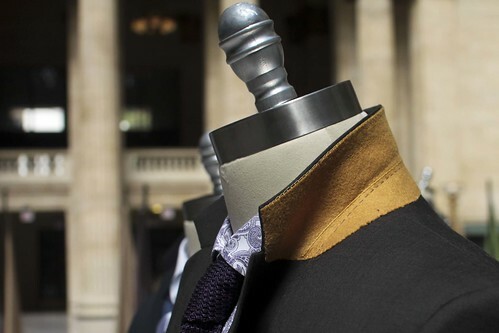 They seemed to have a better model and product than Suit Supply, another custom tailor which just popped-up on Rush St.
Great article Jeffrey. Looking forward to your review of the suit. This is so, SO interesting! I can virtually feel my brain cells firing! Thank you for such an eloquent write up and insight into a really interesting initiative. Yes, their approach looks so clever and could be adapted in so many ways. I can't wait to read about your suit. I think these guys should employ YOU! Wow, this is pretty amazing, I'm looking forward to seeing how your suit turned out. Clearly, retailers could learn a lot from these guys! I tried these guys out (online). Or rather, my partner tried them out. The stuff came out looking pretty standard, the fit wasn't great (actually, given that I sew and am used to taking measurement and was very precise at measuring to their requirements-it was about average). The quality was-quite shoddy. Lots of unfinished hanging threads, not very good quality fabric, crappily attached buttons-I was pretty mad at them-considering I could get better quality from RTW here in Melbourne and the fit would be better because it would have been tried on first. I won't be buying from them again but it'll be interesting to see what your experience turns out to be (although, having measured you themselves that part should be less of a problem) especially with the quality of fabrics and the actual sewing itself..
Hello Jeffery, always like to check your post regarding your opinion how you look at this industry from a technical point of view. I worked for a big wool fabric and suit manufacturer in China.i pretty much like your term the generation smartphone and it precisely describes the target consumer of this industry.Thanks and please keep sharing info what you find in your new MTM suits. Thank you for this detailed article, their approach is definitely "new" and it will surely catch many peoples attention. I do believe though, that this concept will not exist very long in the way it is now. Yes, smart phones are the future, we all know how to use them and they are fun, but I can not imagine that a lot of experienced suit wearers will be drawn into this product. I cannot imagine that customers who enjoy the "bespoke experience" will find interest in this kind of sales process. How far, or deep, can Indochino take a customer in terms construction, fit and other details. I don't believe that we need our smartphone around us in every second and I don't believe that a cutter or fitter needs a phone to keep record of my measurements. Draping cloth for display reasons is nothing uncommon with tailors, it's nothing new, much more something that was done a hundred years ago and should be done more often (because swatches can be very confusing). Making things easier and more simple is definitely the right approach! Still I ask myself if these guys are doing all of this because it actually improves the garment, or does it just help to catch the interest of "first suit buyers". Is it really so tiring and confusing to buy a suit? I honestly believe that it only takes a good salesman with good taste to advise a customer well. All of this high tech around a suit is just glamour that will fade once a second or third suit is ordered. I also cannot imagine that any tailor will be able to afford any branding of this type, nor will any tailor employ staff to take undertake all of this. Don't get me wrong, but I also have the feeling that in Europe not many people will enjoy this experience as much as in North America. I don't mean to be rude, but this experience is exact the opposite of why people go into Savile Row. The question is, what do we (handcraft tailors) learn from these entrepreneurs. What could improve our daily work process? And what can market our traditional handmade suit better into the 21st century? It is definitely customer service and simplicity. I will instantly grab your RSS feed to stay privy of any updates. Solid work and much success in your business enterprise!Thank you so much for giving light to many problems we haven’t come across before using your blog. Great information on this company and it is very insightful. I'm actually doing some research on Indochino and may approach them on my consulting services. I've been in the fashion trade for the past 27 years gong back to my Harry Rosen days when he was still running his mens clothing stores. This company is starting to peak my interest with their innovative approach. My suit arrived today - three days earlier than promised. The jacket and vest were at least 2 sizes too small. I'm a 39-41 R depending on the brand, I couldn't get my arms into the suit. The sleeves were so tight I couldn't flex my arms. I would guess this was a 37 short a most. The fabric was great as was the construction. Really sad that I have to send the suit back. It was a beautiful garment. But that is what happens with "traveling tailors." The person who fitted me clearly did not understand men's suit. All in all, a negative experience. Interesting blog post, and interesting follow up comments. I, like others, cannot wait to see what the results are. I'm very eager to hear how your suit turned out. I did the traveling tailor too, and my suit turned out laughably bad. Before going to this traveling tailor event I had ordered a shirt from Indochino and it turned out not perfect, but pretty good - I thought being "professionally" measured would get an even better result. WRONG. I could tell the "tailor" had absolutely no idea what she was doing. Thankfully a well dressed man who seemed in command of the situation took over and helped her out. I was impressed by the whole operation and was swayed big time by the promise of custom fitted clothes at a reasonable price so I bought a suit along with a 3-pack of shirts. The shirts arrived first, and fit pretty much perfectly. Seeing how it appeared they had my shirt measurements right on, I asked for a remake on that first shirt I had ordered Hopes were very high for the suit. The suit they made was a joke. The sleeves were skintight and too short (showing like 2" of cuff). If I raised my arm, the sleeve would get stuck on my forearm. The pants were just as bad. I could almost split the thighs by lifting my leg. Definitely couldn't sit down or I'd rip them like the Hulk. Asked for a remake on this suit, and bickered back and forth with their customer service on the measurements because it seemed like they were going to get it wrong again. And I was right - my remade shirt arrived and the sleeves are WAY too short. Don't know why they went back to screw up the sleeves when they had it correct before. This has become an incredible hassle. Remakes, arguing with Indochino...should've just done it the old fashioned way. This post was really impressive and I am amazed with the information of this blog. It is nice that you are sharing about the story of clothing and this was an exactly I am looking for. I really appreciate with your great blogs. Thank you. Great review! I just ordered my first garment from IC (a blazer) and am very happy with it. Your endorsement of the company is encouraging. I'm sad that I missed this event in Union Station. It looks like these guys really know how to throw a polished, branded event. Like you said, very "Jobs-like". Are you a DC guy?